On the 1st day of a week, we got 1st limited release for the week - LE decor, Christmas inspired of course! Most of the items are gorgeous, perfect for the holiday. Pricey too, nothing unusual for Limited collections. That animated window was one of the best things released. There was also nicely decorated Christmas tree, more expensive than usual trees we'd gotten for Christmas last few years. In my opinion, collection is really, really nice, but I am not sure if it is worth paying that much stardollars for stuff you will use for about a month, and later just put them back in storage or try reselling it. If anyone wants to buy, of course. On Wednesday, we got yet another 2 floors of Nelly.com store. It is true that I adore the store. 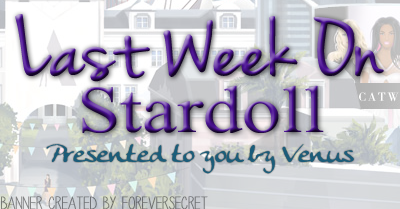 In fact, it is one of my favorite stores on Stardoll. Still, this collection seems a bit random. Unnecessary. And not so appropriate for winter season. Not a big fan of collection overall, but there are some nice pieces. I am trying to restrain myself from buying dresses, as I already have too many of them. But some are really gorgeous. Do not take it as offense, but buying a year of royalty membership for some random gifts just doesn't seem appealing to me. What I also dislike is that you get different gifts for buying 1 month, 3 months, 6 months and a year, and the same situation is with boy accounts. Yeah, you also get a nice painting for buying 3000 stardollars, or different set of gifts for 12 months that appear to some users. Quite pricey! But in case you were planing to spend some money you got/will get for holidays, go for it. For me, that purchases 2 weeks package every once in a while, not so appealing offer. On Friday, we got new Mawi jewelery collection. 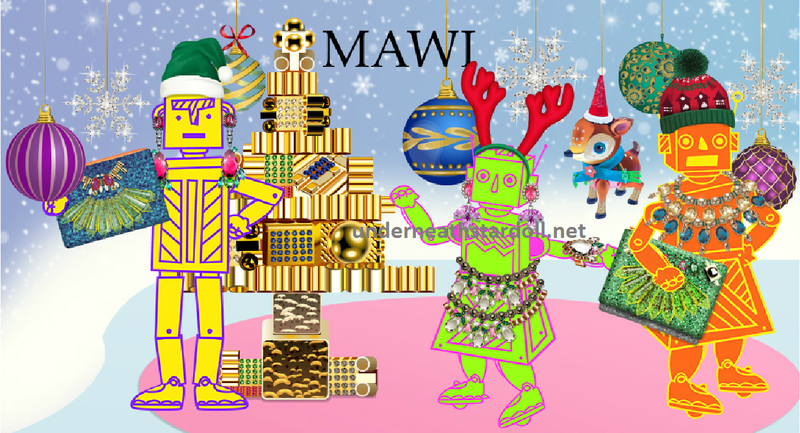 Mawi is a store with lots of unusual jewelery. Instead of simplicity, they try to incorporate as many colors and shapes. There are some cute clutches. Still, I'm not a big fan of buying jewelry, mostly because I am too lazy to change my doll's look. And no offense, but those robots make it hard to see the actual pieces. Cut thing they added are Santa hats, which are cute and can add a nice touch to your outfit when dressing for holidays. 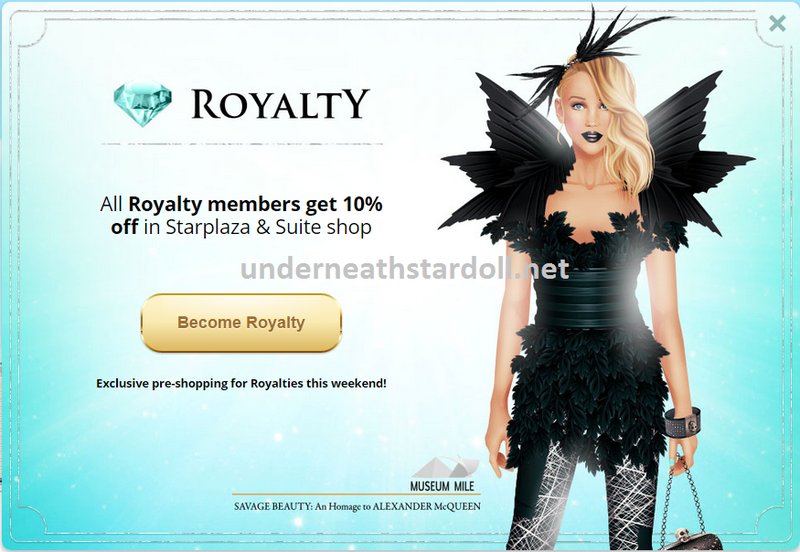 From now on, and until forever, as Noelani said, all royalty members will have 10% discount on all stores. Which is really fantastic idea. When Royalty membership was introduced at 1st, there wasn't much a difference between royalty and superstar members, except for few gifts occasionally. Now we had even option to buy new collection of a new limited store (which I will mention later) before everyone else. Makes me glad I am royalty member. And on Saturday (which is not the usual time Stardoll releases stuff), we got new Museum Mile collection, inspired by brilliant designer Alexander McQueen. The collection is really beautiful. Yeah, there are some not so nice pieces, but I managed to grab some of my favorite items. Wish I could buy more though. Some users seemed disappointed with the choice of items offered, and there could have been some nicer ones. Quite a treat for McQueen stuff collectors. Told you it was interesting. What is your opinion of the week? And of course, chose your favorite moment, vote, comment, and see you next week.